Williamsburg, Brooklyn; Silver Lake in Los Angles, and Pacific Northwest cities like Seattle and Portland, all score high on the millennial coolness-scale. But in my own teen offspring’s opinion, these cities don’t hold a candle to Berlin. The capital of Germany is infused with energy, creativity, contrast, and promise. An affordable cost of living encourages young hipsters to stake their claim, attracted to the “anything is possible” vibe. The cutting-edge atmosphere and famed nightlife is combined with Berlin’s complex and turbulent history, which is impossible to ignore. A visit to Berlin is a great catalyst for thought-provoking conversations with your kids. If you’re looking for a teen-centric, cost-conscious Northern European vacation destination, read on. The East Side Gallery is a must-see for anyone visiting Berlin, but graffiti art holds particular appeal to teens. This 1.3-kilometer open-air mural costs nothing to view, and you will be richly rewarded for doing so. The wall is a dense pop-art display and a fascinating social and political commentary. 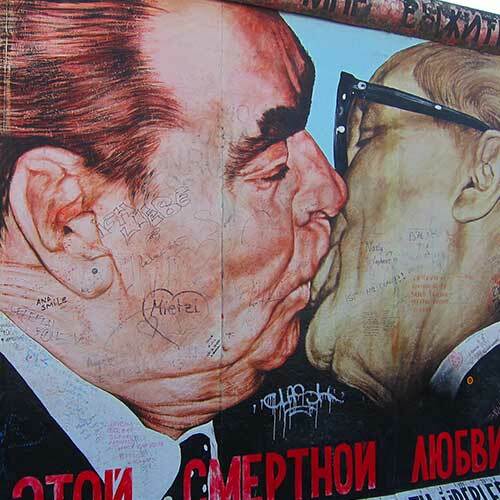 When the wall that divided Berlin fell in 1989, East Berliners finally had the chance to artistically express themselves in a public forum, after decades of repression. Social media savvy kids will be in good company, as taking a selfie to post on Instagram or Facebook is practically mandatory. Keep your eyes open as you walk around town for the fine examples of graffiti all over Berlin. Families visit the spa together in many cultures and spa services for children is a hot-button issue in the U.S. Forward-thinking families might want to consider experiencing one of Berlin’s spas. Teens should go nuts for the nightclub atmosphere and modern soundtrack at trendy Liquidrom. Be advised that swimsuits are optional and in fact forbidden (for hygienic reasons) in the co-ed saunas. Pamper yourselves as you float in warm pools, steam, sweat and plunge the afternoon away. Sultan Hamam is a tamer environment. It’s women only Tuesday-Saturday, exclusively for men on Mondays. Co-ed family day is held each Sunday, with swimsuits required. You’ll feel transported to an exotic Turkish bath house as you luxuriate in the eucalyptus-scented steam room. Book the Oriental Package and you’ll be scrubbed, soaped and massaged to a state of bliss. Both spas are reasonably priced. Berlin gives Paris, London and New York a run for the money with scores of museums and hundreds of art galleries. For a comprehensive look, check out our Berlin Attraction Guide. Don’t miss the Jewish Museum. The unusual building is shaped like a deconstructed Star of David. Though historical in perspective, the museum does an incredible job telling intensely personal stories, alternating between the glories and the persecution of Jews throughout time. It is very interactive for visitors of all ages, drawing you in with a variety of exhibits that appeal to the senses and to human sensitivity. Purchase a family ticket and two adults and up to four kids can enter for only €14. One of the many ways Berlin commemorates victims of the Nazis is withStolpersteine or stumbling stones. These brass plates are embedded in the sidewalk concrete and are a personal memorial to a Jewish victim who lived on the street where the stumbling stone is placed. Each slightly raised plate has the name and details of the tragic death of a former resident. They are purposely made for you to stumble on, to encourage contemplation on the individual life lost. Berlin is a top city for hungry tourists with thin wallets, thanks to a creative fast food scene. The Doner Kebab was invented here. Thin slices of flavorful meat carved from a rotating spit, fresh veggies, and your choice of sauce are piled into warm bread. This hearty sandwich rarely costs more than €3 and you can find stands all over the city. Our favorite was All in One on Rosenthaler Strasse in Mitte. The ultra-fresh lettuce, cabbage and tomatoes added a salubrious crunch. Currywurst is another food Berliners have embraced in a big way. It’s sliced bratwurst served in tomato sauce that has been liberally laced with curry for a sweet-spicy kick. Burgermeister in Kreuzberg is a prime spot to sample this hometown favorite. It is unusually located in a converted former public subway bathroom. They sell burgers, including a tasty tofu variety, and French fries, so less adventurous eaters should be satisfied for only a few euros. If you’ve got a blossoming gourmet in the family, check out Berlin Food Tour. Bilingual owner Bastian is a knowledgeable and charming local who leads diverse culinary itineraries. Even if they’re not foodies, hungry tourists will learn a lot about the culture, history and sights of Berlin as they stroll the city nibbling. Consider booking the chocoholic, cake or Mitte neighborhood itinerary and you’ll sample delicious delicacies not found in any guidebook. Kids pay approximately half the adult price and are most welcome. Tip: Walking tours last several hours, so this is not for fidgety toddlers. Mitte means middle in German and staying in the Mitte district puts you in the middle of everything. This hipster-haven is brimming with eclectic shops, restaurants and nightlife. Fashion-forward Berliners congregate here, which makes for great people watching. All this action can be yours, even on a tight budget, thanks to dozens of bargain-priced hotels. Our inexpensive family room at the Ibis Styles was clean and compact. The colorful common area includes communal computers and a kid’s play area, stocked with games and toys. The nutrient-packed complimentary breakfast buffet was beautifully presented. Fresh fruit smoothies, bowls brimming with shiny apples and whole citrus fruits, breads, cereals, cheeses, cold cuts and hard-boiled eggs kept us going well into the afternoon. The kids should enjoy watching the last of the late-night partiers finally exiting the dance clubs just when they are starting their day of sightseeing. European families have been staying at hostels for years and the rest of the world is catching on to this low-cost type of accommodation. Generator is a trendy chain of hostels with central locations in Mitte and popular Prenzlauer Berg. Private rooms with en suite baths are an excellent value. The Berlin Welcome Card is an essential for families on a budget. Purchase a 2, 3 or 5-day card and you’ll get unlimited rides on Berlin’s comprehensive public transportation network, including the U-Bahn, S-Bahn and buses. The cards start at around €20 for the 2-day option. You’ll also receive discounts at hundreds of sites, museums and tours. When an adult purchases a card valid for zones A, B and C, they may bring up to three kids between the ages of 6-14 on board free. You may purchase cards online, at Berlin Tourism offices around the city or at many hotels. Air Berlin offers non-stop flights from U.S. cities such as JFK, Chicago, Miami and Fort Myers. They are a member of Oneworld Alliance, so you will be getting those coveted frequent flyer miles. For more information, go to Visit Berlin and the German National Tourist Board. Note! This story was accurate when it was published. Please be sure to confirm all rates and details directly with the companies in question, and stay up to date with current events to ensure a safe and successful trip.